Having seen such a colossal sorrow at close, we had the burning urge to do something more, had rounds of discussions on possible ways in partaking in the rrelief operations. SYMA has been fortunate to have support from philanthropists. Mr. Balasubramaniam of Mangal Tirth Estates (of Spencers, Mount Road – fame) has all along been a benevolent donor and he again proved his large heart. He planned relief material for the most needy and roped in SYMA for distribution at Cuddalore. On 29th Dec 2004, our volunteers accompanied Mangal tirth staff and bought items like - stoves, mattresses, utensils etc., and packing went on late in the night. Our planning proved to be so helpful in hindsight made us happy. 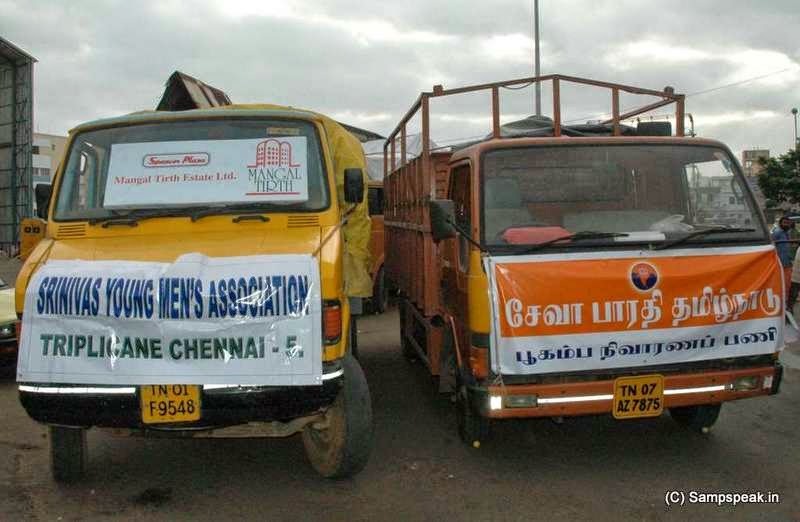 Early morning on 30th we left for Cuddalore in a convoy of a Car, two trucks laden with Stoves, mats, utensil sets, new dress sets, rice bags plus another truck laden with rice/dal of Seva Bharathi, followed by a van full of SYMA and Mangal tirth volunteers. During the voyage, there was some disturbing news about tsunami striking again, compounded by the Govt’s warning of the same. We continued unfazed. 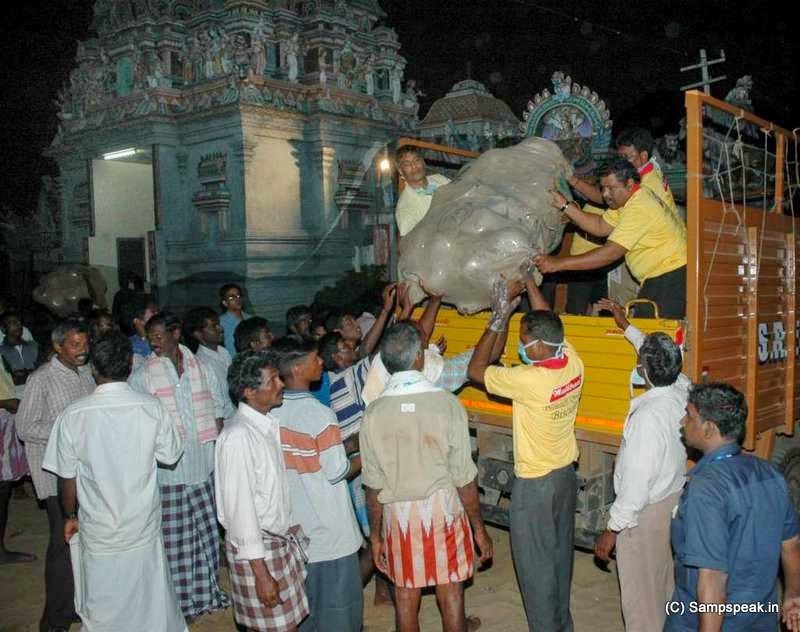 Almost all of the volunteers travelling were getting continuous calls from worried relatives stating that ‘Sun news’ was stating of a recurrence of another tsunami possibly striking Cuddalore and how unwise it was to go there at that time. At some point of time, we spoke more than a couple of times to a mobile no. provided – and the man on the line assured that there was nothing to fear. We had heard and read lot of good response by the people of this wonderful motherland- Vivek Oberai a famous actor who would probably never have heard of Cuddalore before, camping and adopting a village; Matha Amruthnandamayi donating Rs.100 Crores; Volunteers of Sri Sathya Sai Baba rendering great work and more. We on our way could sense and witness instantaneous reaction of good hearted samaritans. There was the small medical shop at Panruti (or was that nearer Neyveli- and Roja Medicals, if my memory is right) where we had vaccine injection. We were around 25; the owner refused to take money; stating ‘when people travel miles to be of some help – he too must have some role’ and humbly requested it to be his contribution to the relief workers. Many organizations, big and small were rushing there with relief materials. People from nearby villages - poor in economic strata but definetely rich in heart, were pumping their mite distributing food and clothes; many such vans were seen with cooked food ready for distribution. There were corporate aids also. 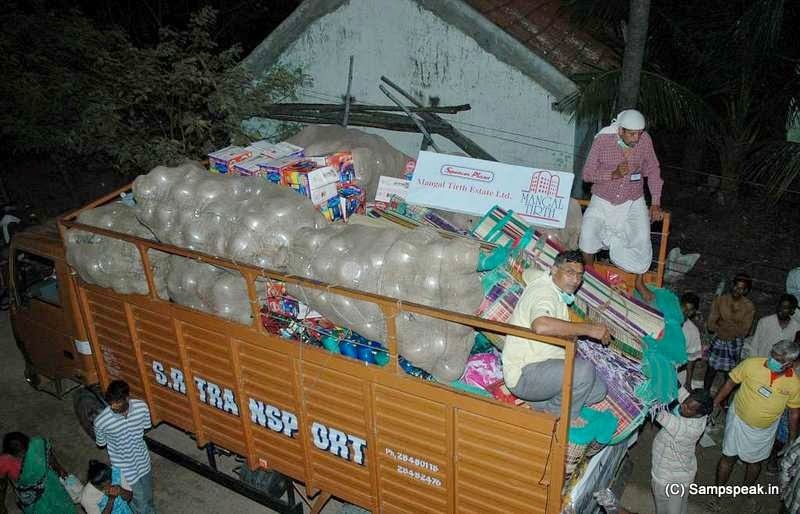 TVS Motor Co., Hosur had sent a big truck (looked like a 40 ft container) with medicines/material, accompanied by a team of Doctors and other volunteers. RSS had set up a base camp at Cuddalore and its volunteers could be seen moving around everywhere. Mr. Velumani, another exuberant officer from the Government Relief Centre guided us to Parangipettai, a cluster of small hamlets. Each village seemingly had a horror story, more or less similar with loss of life of fishing folk. While we were amazed with the work of velumani another localite, Arumugam running a social welfare organization - BLESS joined us. They were very familiar to the people in the area having helped them. On that fateful morning too, Arumugam had evacuated scores of people when the warning was issued. 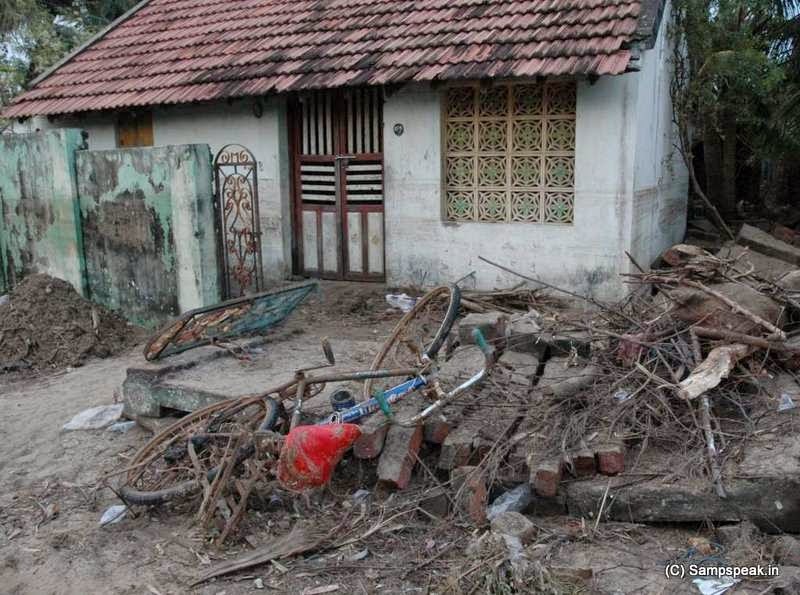 They steered us to Nadukuppam, a low lying hamlet which was battered by tsunami. The ravaged ruins, water mark upto 10. could be seen. The disaster was fresh in the memories of the villagers. The panchayat leader Chandran was a composed man who organzied receipt of relief material. Material enough for that village was off loaded and stored in the local balwadi. As the families had fled the place, it was to be rationed subsequently. Many vans came here for distribution. A score of Anandmargis from far off West Bengal had come; I engaged them in a conversation and asked them – what they will do and how long – pat came the response – there was no time frame and nothing fixed. They would stay for a month or so till some normalcy returns – one of them said, he is good in making chapathis for people and other claimed to be an expert construction worker – they were prepared to do any manual work in rehabilitation. There was a young girl accompanied by her friends, coming from a software company from Bangalore distributing what they had collected at Bangalore - truck loads at that. She conversed with us (they had spent much in buying new clothes - and at that point of time, people staying outside home, were not keen on clothes) – she enquired on what made us plan for utensils, carpets, mattress and the like and shared some food with us. The project officer was also paid visit. It was late in the day, and pretty dark night - a convoy of Police vehicles came; and it was Senior Officials - there was Mr. SR Jangid, IG along with Mr Sanjay Arora of Special Task Force with many police on patrol. The IG got down and had discussions with the people. He asked us why we were there at such a time – it was clear that they had been touring the coast without taking break – caring for the people – strict in ensuring that there was no harm to those lodged in relief centres by unscrupulous elements. The Top official was told of many people having been killed by a falling building during tsunami – he evinced interest but was told that area was slushy and poorly lit…. he ordered the jeeps to be stationed directing their powerful lights and got down running to see the spot and talk to place…. great people all around. Next halt was at a nearby village, where almost the entire population had sheltered in the big Amman Temple. Govt. officials were quick enough to have restored electricity in these places. 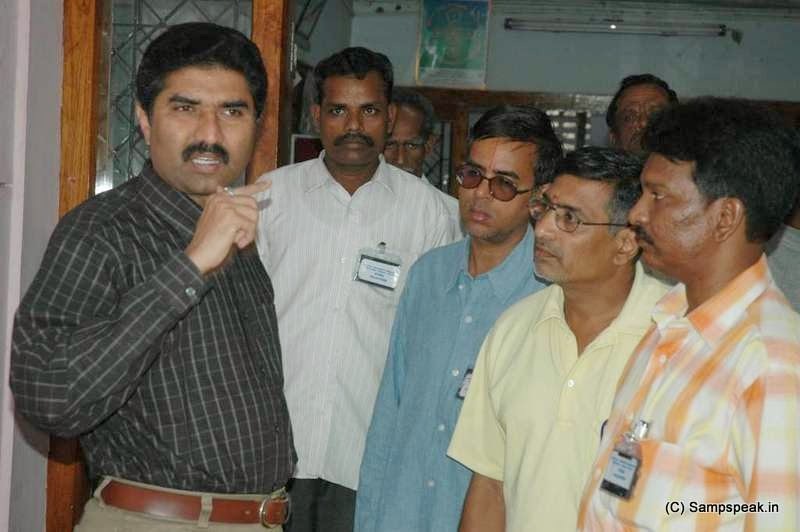 At this place too, the smooth distribution was ensured by their local leader. It was midnight – we then went to Thirunagari, near Sirkazhi (the place of Srivaishnavaite azhwar – Thirumangai mannan). Though this is not a coastal village, many of affected people from Poompuhar and nearby had rushed in and there was not much relief coming this way. At night we off loaded here - biscuit packets, clothes, 15 bags of rice etc., for distribution to them. The night (rather a few hours till the early morning was spent here). We all returned with a heavy heart grieving the disaster and devastation that was seen all around. We are very grateful to the noble Bala of Mangaltirth Estates for providing succour to the suffering people and for giving us an opportunity to serve the humanity at the time of their distress. Here are some photos of our visit.